and, instead of using RAG-based recombination, uses a gene conversion system to generate diversity. There’s a temptation, even for those who intellectually know better, to assume that “primitive” animals have “worse” systems; so because lampreys are more like the common ancestor of vertebrates, their immune system must be “worse”. 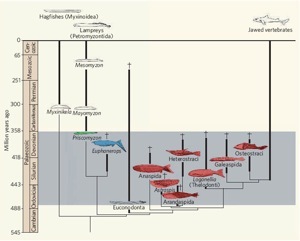 (Hagfish and lampreys, which may have diverged some some 500 million years ago — see the figure to the right;3 click for a larger version — have very similar immune systems, so this system must be at least that old.) In some ways the mammalian immune response does seem to have some advantages — faster memory response, for example. 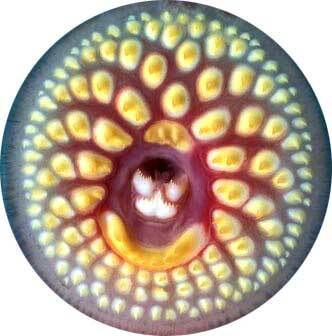 Still, lamprey immune systems have served them well for 500 million years, which is more than we can say about ours; and in some other ways lampreys do better than we do. They have if anything a greater diversity to their receptors, for example, potentially generating more than 1014 different receptors — compare to our roughly 108 T cell receptors. 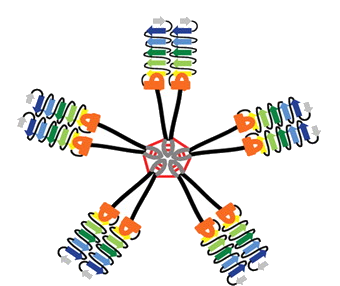 Max Cooper, who has done much of the work on lamprey immunity,4 has just published a paper showing off some other unusual properties of lamprey immune receptors. 5 Since there’s no system for making lamprey monoclonal antibodies that’s analogous to the mouse monoclonal antibody systems, he used a molecular cloning approach to express monoclonal variable lymphocyte receptor (VLR) -B cDNAs from immunized lampreys. These things clearly have potential to be useful in all kinds of things — a nice example of basic research giving rise to clinically and commercially useful tools.